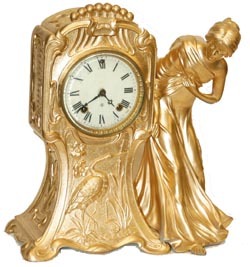 Ansonia Clock Company, figure clock, "Girl and Swan", C. 1894. Typical Ansonia design. Metal case is 13" high, completely refinished in gold, a little bright, but easier to tone down a little than to brighten up. 8 day movement, half hour strike on a standing gong. The round movement is signed and it is running. Good one piece porcelain dial, French sash, beveled glass, correct back door, pendulum, and hands. A little different clock, and very nice.